OOS International together with other companies will sponsor Dutch ambitious team 24Vision with their international challenge on Amsterdam Dakar 2017. Like OOS International, this team with mechanics who are not afraid to get their hands dirty is driven by technology and becoming one of the best on global projects. This adventures rally of 18 days will start on October, 28th in Amsterdam. The team exists of 8 members and 4 cars with owner of 24Vision and board advisor of OOS International Marc Honders who initiated this team challenge, engineer and project manager at Huisman Menno Lint, operations manager at Rolldock Wiebe Broeksma and technical top experts with a passion for cars Cees Fok, Jan Broeksma, Rene van Dijk, Nils Heijboer and Erik Hessels. In preparations up to this once in a lifetime road trip the team successfully gone through the first tests on the Dutch road at the Barrel Day on Saturday September, 23th. 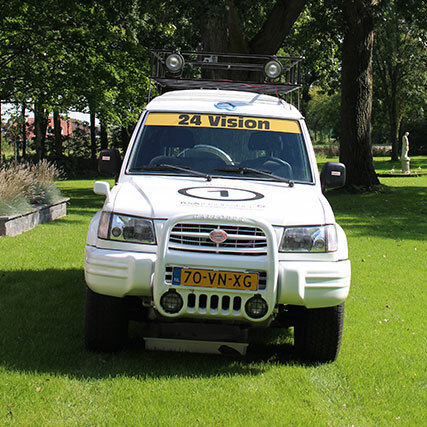 OOS International wishes team 24Vision great success and is confident the team will finish with the best in Dakar. Read more about the Amsterdam Dakar Challenge on the official website http://www.amsterdamdakar.com/. For more information on the 24 Vision team, please visit https://amsterdamdakar2017.com/.